Throw the onion, carrots, celery and garlic in a food processor. Chop until finely diced. In LARGE pan, heat dollop of olive oil over medium heat. Throw in chili flakes and cook for 3-4 minutes. Add diced vegetables and season with salt and pepper. Cook vegetables until caramelized, 15-20 minutes. Don't step too far away and stir constantly - the line between browned and burned is a fine one. Add oregano, basil and thyme to pan and cook until fragrant, 2-4 minutes. Add 3 cups beef broth and deglaze pan. Continue cooking until broth has reduced by 2/3rds. 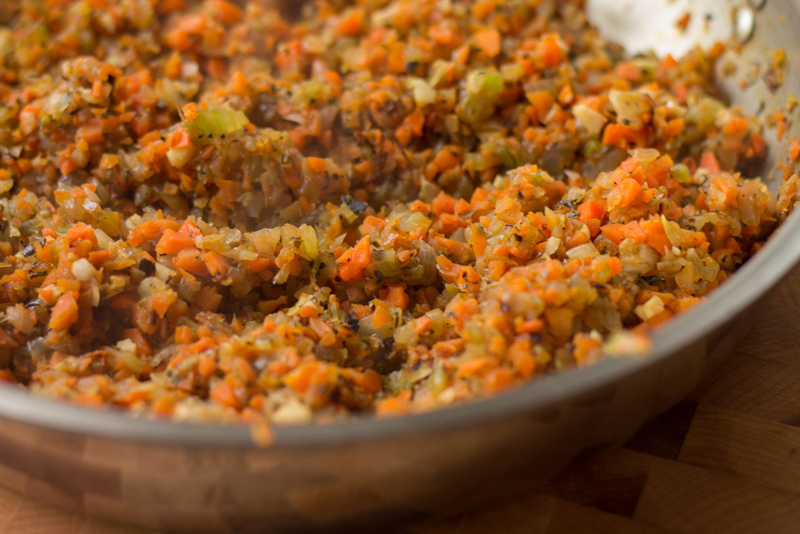 Remove vegetables from pan and set aside. Add more olive oil to pan over medium heat and add ground beef and pork. Season generously with salt and pepper. Cook for 15-20 minutes, stirring constantly. Brown the meat. Again, the line between browned and burned is a fine one, stir constantly, scraping the bottom. Work the meat. It should be a fine crumble and browned all over. Add tomato paste to the pan and cook for 4-5 minutes until browned. Add red wine to the pan and stir. Cook until wine is reduced by half, about 10 minutes. Add cooked vegetables back to the pan (or add vegetables and meat to sauce pot) along with can of diced tomatoes, bay leaves and 1/4 cup parmesan cheese. Stir to combine. Add water until the meat is covered by ~ 1 inch. Bring to a boil and reduce heat, simmer for 3-4 hours. You will need to add water as it evaporates. It's a simple process. Reduce, add more water. Reduce, add more water. Etc. Up next: cook your pasta. Make sure the water is well seasoned, then add the pasta al dente to the pasta sauce. Toss to combine. Let it sooooak up the sauce. If the sauce is too thick, add some pasta water. Toss with remaining parmesan and fresh chopped parsley. Check out our Original Blog Post on Rigatoni Bolognese Here.